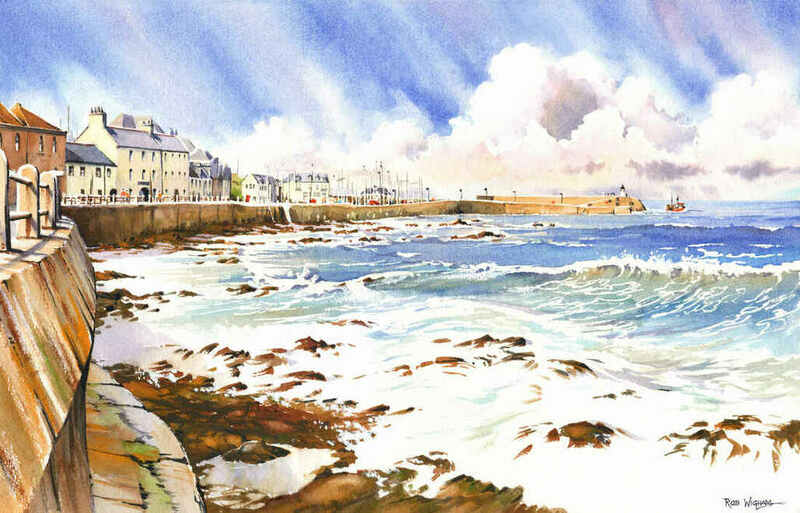 'Banff Harbour Sunshine', watercolour, 55 x 35 cm. Banff sits adjacent to Macduff on the Moray Firth coast of Aberdeenshire in north-east Scotland. Banff harbour still has fishing boats but is increasingly used by leisure craft, whilst Macduff is predominately commercial. This is a view across the rocky bay to the very picturesque Banff harbour from the sea wall of the low shore of Church Street. I was fascinated by the movement of the water around the rocks at mid-tide, which I've tried to represent here With water as interesting as this, this was great fun to do!